Te'Ja Twitty looks to drive to the hoop against against a Milwaukee defender in the Women's Basketball Invitational semifinal game last season. The Spartans finished the 2016-17 season 20-15 overall, posting the program's first 20-win campaign since the 2006-07 season. It’s a weekend full of season openers and tough tournament match-ups for UNCG’s basketball and soccer squads. 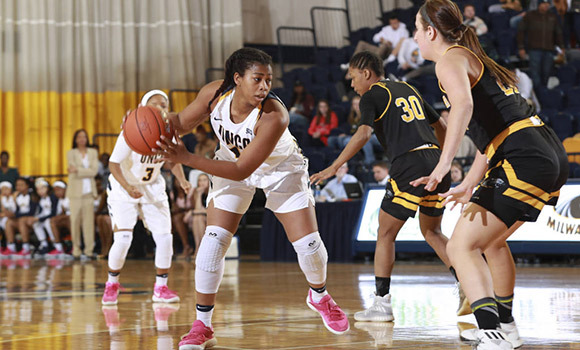 Men’s and women’s basketball tip off on Friday, with Head Coach Wes Miller’s team traveling to Charlottesville to compete against ACC foe Virginia, and Head Coach Trina Patterson and her players hosting Southern Wesleyan at Fleming Gym on campus. The men’s game will be broadcast live on the ACC Network/ESPN3, and the women’s game will be available on the SoCon Digital Network. For men’s and women’s soccer, it’s tournament time. The women’s soccer team will compete against Duke on Saturday in the first round of the NCAA Tournament. The game is at 7 p.m. in Durham and will be broadcast live on the ACC Network/ESPN3. On Friday, men’s soccer will take on Furman in the semifinal match-up of the Southern Conference Tournament in Greenville, South Carolina. The Spartans enter Friday’s game with a 9-7-2 overall record after finishing second in the league. The game will be broadcast on the SoCon Digital Network. Keep up with all the action by visiting uncgspartans.com, and make sure to follow UNCG Athletics on Facebook and Twitter.